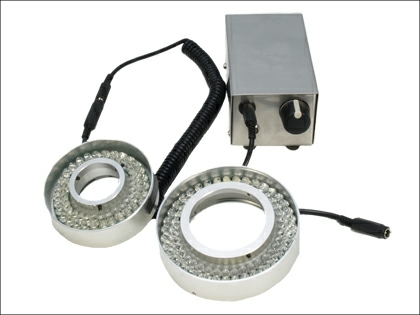 We have two versions of our of LED ring light. 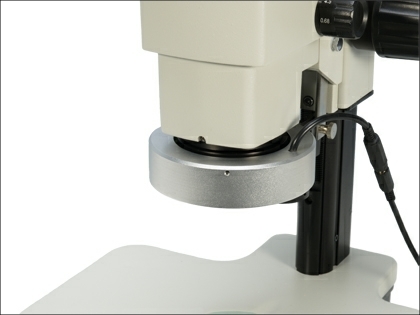 The smaller is designed to fit our Microzoom series, and the LED78 all our zoom stereomicroscopes. It is possible that the LED78 unit may fit other makes of stereomicroscope providing the stereohead has a parallel sided case and a diameter of no greater that 65mm. The Brunel LED78, has a brushed steel ring with 78 concentric LED’s, powered by a stand alone transformer. The LED bank has full rheostat brightness control, and adapters for the IMXZ, BMS, BMZ and BSR stereomicroscope systems are available that allow the ring light to be attached to the internal screw thread of the turret. A smaller version with 48 LED’s is available for the Brunel Microzoom system.